The amount of new development in the SE Uplift coalition neighborhoods has been significant over the past year. Apartment buildings are seemingly springing up left and right, homes are being demolished and replaced by something different, and the splitting of lots is continuing to take place. Our quadrant is clearly a place where people want to live and where developers are eager to cash in on that desire. One issue that has sprung up from this new development is the impact it can have on the solar access of neighboring properties. 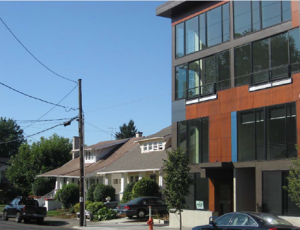 You’ve probably seen examples of this where a single story older home is right next to a recently built modern home that is much taller and bigger in scale. The difference in height and the placement of the new home effectively blocks the older home, and its backyard, from light it used to get prior to the new home’s construction. For many of us, access to light seems like it should be a right and when it has been taken away it feels like our rights have been violated. The Doctrine of Ancient Lights, based on English law, essentially makes that case by saying that after a number of years the owner of a long-standing building has the right to maintain her home’s level of illumination. If a neighbor wants to build something that obscures the light, the neighbor must get permission. This doctrine has been rejected in the U.S. courts, most notably by the Florida Appellate Court in the landmark Fontainebleau Hotel Corp. v. Forty-Five Twenty-Five, Inc. case in 1959. The court ruled that a property owner does not have the legal right to the free flow of light and air across the adjoining land of his neighbor. Even with this ruling, there are regulations that cities can enact to try to protect solar access. In fact, Portland once did this very thing. Back in 1986, Portland City Council passed ordinances that prohibited new houses from casting shadows on their neighbors. The impetus at that time was to encourage the use of a solar energy. The regulations were met with strong resistance from the Home Builders Association of Metropolitan Portland who argued that they limited the types of homes that could be built and drove up the cost of doing business. After three years of contentiousness, a compromise deal was reached with most of the solar access regulations being removed. What remains in the zoning code today is very little in terms of solar protection. The current pace and form of new development has led to a renewed interest in exploring ways to protect solar access. 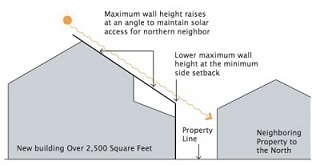 For some people, solar access protection means limiting the building heights of adjacent properties. That certainly would be one option that could be explored. Some cities have had success with regulations that require developers to orient and design lots so that structures of a certain height will not block solar access to adjacent lots. This often takes the form of requiring buildings to have “step downs” in height as it gets closer to an adjacent property. Another approach is to create “solar setbacks” for new development. These are determined by a formula that considers the height of a building, the angle of the sun when it is at its highest point, and the topography of a lot. Other municipalities have processes for obtaining solar access permits or recording solar easements, which can establish the right to solar access for an existing or planned lot (this usually is done to protect solar panels from being blocked). A few cities have used a concept of a “solar fence” which is a hypothetical opaque fence that encircles a property at up to a certain height above the ground. While some of these options would be difficult to implement in an urban environment like what we have in our neighborhoods, it seems that they might be at least worth considering as our city continues to try to accommodate new development while also trying to maintain the existing character of the neighborhoods.